In central New York State, set just beyond the rolling northern slope of the Catskills, the village of Cooperstown marks the southern rim of Lake Otsego. Its streets are filled with wood-framed homes that become charmingly older the closer one gets to the lake ---a virtual history of American vernacular styles from Colonial to Levittown. Novelist James Fenimore Cooper called Otsego “Glimmerglass,” so fine and clear were its waters, then and even now. Named in 1785 after its founder, William Cooper, father of James Fenimore, the village marks the place where Lake Otsego gives birth to the Susquehanna River. That river meanders south and east from its Otsego origins, flows down through the green valleys of Pennsylvania, then finally into the Chesapeake Bay, and the Atlantic. Half a century ago, a visitor to Cooperstown would have found a small, quaint, New England-ish village with a few cozy places to eat, shops that sold most of what folks needed for their daily lives---a couple of banks, a bookshop, a druggist, a barber shop, a hardware store, a greeting card and newspaper shop and several dry-goods stores—one of which was the Village’s biggest store, J. J. Newberry’s. In the middle of this two-block long commercial main street, Smalley’s Theatre, just a hundred yards down from the entrance to Doubleday Field, changed picture shows every Friday. At the eastern end of Main Street, two stone buildings serve as the boundary of Cooperstown’s commercial center. Graced with white columns that contrast with narrow slabs of grey stone walls, these two sturdy yet elegant structures are evidence of the nineteenth century financial and industrial heritage that found a way to exist amidst a Jeffersonian village. The larger of the two, the Village Hall and Library, looks diagonally across Main Street, to a smaller red brick building, distinguished by a striking wooden red door. The library surely stood for the literary heritage bestowed on the village by novelist James Fenimore Cooper, whose characters still seem to roam the woods and hills that surround their Glimmerglass. And, the other was the original Baseball Hall of Fame. In fact, both owed their prominence to the dominant family of the region, the Clarks. Heirs to the Singer Sewing Machine fortune, thanks to the partnership between patent lawyer Edward Clark and inventor Isaac Singer, over the course of the past century and a half the Clarks endowed this small village with a set of graciously appointed cultural institutions, and thousands of acres of protected natural lands, that grant Cooperstown its exceptional quality. The National Baseball Hall of Fame and Museum may be the centerpiece, but the Fenimore Art Museum, the Farmers’ Museum, the Mary Imogene Bassett Hospital (now Bassett Healthcare), the Otesaga Hotel and accompanying Leatherstocking Golf Course, and the Clark Sports Center, now the setting for the Hall of Fame’s inauguration ceremony, have transformed William Cooper’s town into contemporary Cooperstown. The Clarks have preserved more than eight miles of forested property that tumbles steeply down to the lake along its Eastern shore (as well as other tracts to the south and west of the Village). Undeveloped and pristine, this private property, disturbed only by a winding county road sheltered by oaks and pine, takes one directly back to Cooper’s world of Natty Bumppo, of Shadow Brook, of Council Rock and Sunken Island. In autumn, this magnificent expanse shimmers orange and gold in the season’s late afternoon sun. These October reflections on Otsego’s deep blue waters turn Glimmerglass into a magical mirror. Downtown Cooperstown: The Sunny Side and the Money Side. By mid-October, the village of Cooperstown, like Brigadoon, reappears as if out of a misty dream. The crowds that fill the streets in summer have thinned out, half the baseball memorabilia and card shops have closed, even the paid parking restrictions lifted. It is a perfect time to discover this “hidden” Cooperstown, to experience the warmth of a small upstate village, to enjoy the friendships one encounters, and to stand in awe of the magnificent lakeshore foliage—for the lake is never far. 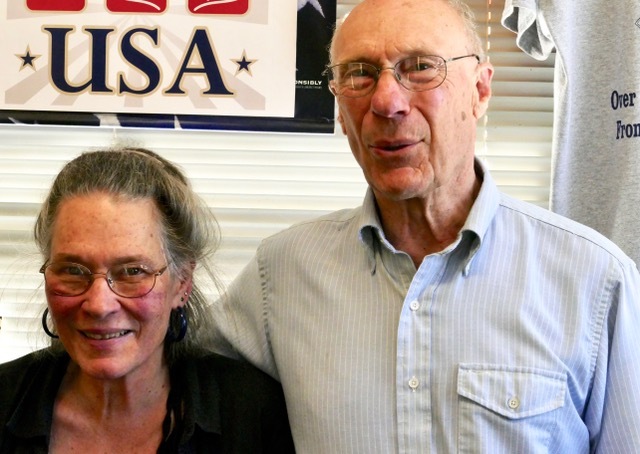 The owners, Gene and Montell Marra proudly explain that theirs is a perfect marketing marriage of Cooperstown’s twin heritage---baseball and literature. But they have fashioned this new tasting room in the spirit of American architectural urbanism. The open space features casual seating, a menu of small plates, and a room-length bar framed by a wide mirror that reflects the entire room back into itself. It is evocative of an old saloon and sophisticated enough for Park Slope. And, it reflects the personalities of its owners-creators. Of course, Gene, the craft distiller and chef comes from Brooklyn by way of Florida and a long career in the restaurant business. As he tells it, about a decade ago, still living in Florida, he and his wife Montell, became friendly with a couple from Cooperstown. Friendly enough that when their new friends invited them to help with their lakeside restaurant, the Blue Mingo Grill (one of the best seasonal dining spots in the county), they saw the opportunity Otsego offered and chose to remain. 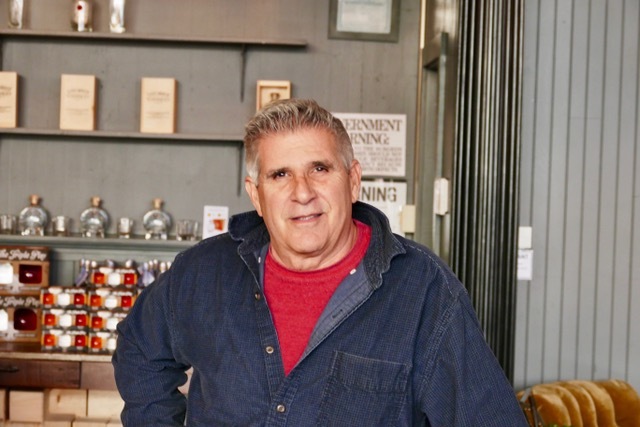 Gene took courses at Cornell to learn the finer points of craft distilling, which he added to a résumé that included business savvy and serious training as a chef at the Culinary Institute of America. He tends to the business but leaves the “look” to Montell. Originally from Florida with a background ranging from waitressing to telemarketing, Montell also spent a decade in Atlanta working as a P.I. Yes, a private eye ---who nevertheless loved to write and make art. Once she and Gene leased the venerable Augur’s Bookshop on the corner across from Church and Scott Pharmacy (repurposed as Yaztremski’s Sports), Montell set about to create the look, the names, the texture of the brand. They had already set their distillery in an old storage building “uptown” on Railroad Avenue, just across Leatherstocking Street from Spurbeck’s Grocery in 2013. Then, after three years of planning and design they opened the Cooperstown Beverage Exchange. Like many others in this story, the Marras moved to Cooperstown from another life and made the town their own. Their combination of creativity and warm civility makes these new contributors to Hidden Cooperstown so valuable and fascinating. Perhaps 50 yards west on Main a young man holds court. He stands, casually leaning into an empty doorway of the shop he owns next to the popular Doubleday Café. His store is long and deep, with caps, shirts, signed baseballs, cards, wrist watches for any team, more cards, and the TV high up on the wall playing an endless loop of Abbott and Costello’s “Who’s on First.” Passers-by always laugh. But the chief attraction for “Safe At Home” is the proprietor, Andrew Vilacky. Andrew sounds like, and carries himself like, a guy from Brooklyn-- which he is -- who sports an old-fashioned New York City (‘dems’ and ‘doze’) accent enhanced by a lively and animated delivery. When he speaks his eyes gleam and his expression punctuates his conviction. More importantly, Andrew only handles authenticated memorabilia. In a collectible world filled with forgeries and copies, he’s honest and trustworthy… and opinionated. Safe at Home is also home to Pete Rose when he comes to Cooperstown, often before the July Hall of Fame Induction weekend. Andrew gives him a safe space--a table outside the store where Rose can sit, schmooze, and sign autographs. Like Gene Marra, Andrew Vilacky has come to Cooperstown from Brooklyn. But unlike Gene, his story belongs to a very different time and place. When he arrived in the U.S. in 1968, he spoke only Czech. His family left Czechoslovakia in the wake of the Prague Spring and his engineer father found work in Brooklyn cleaning toilets and sweeping floors. But, speaking English as a second language in Bay Ridge introduced Andrew to American culture---and took him to college and then to Wall Street, where he worked as a trader. A chance acquaintanceship with a friend who owned Mickey’s Place, a memorabilia emporium on the north side of Main Street in Cooperstown led to some summer work, then to opening his own place---Safe At Home, whose meaning takes on another dimension once one knows his story. In this context, Cooperstown for Andrew embodies the tradition of the American dream, a dream embedded in the contents and meaning of Safe at Home, and in the lively and animated personality of its owner. Not ten feet from the doorway to Safe at Home, the Doubleday Café serves as a quick dining magnet that draws people from all walks of life, and at all times of day. Doubleday’s T-shirts, a town favorite, proclaim, “A Drinking Town with a Baseball Problem”---available in long and short sleeves as well as in a rainbow of colors---as 10 long as you like red and bluish green. The Doubleday is long, deep, and inviting with a well-stocked bar which runs about half-way down the lefthand side of the dining room. Flat screen TVs peer down (volume off) from the room’s four corners. News, weather, and sports twenty hours day. Same as the bar. Doubleday’s menu defies logic---chockful and changing with each meal. Specials are chalked on the blackboard at the rear of the room. But the first seating of the day, breakfast, distinguishes the place. Pancakes with fresh berries, oatmeal as dense at the sticky stuff your grandmother made, and delightful coffee, mild yet flavorful. Like the no-longer famous Valois (pronounced ‘valoys’) in Chicago, the sociology of Doubleday rewards careful observation. Most mornings about 6 or 8 older, yet spry and lively men and women, sporting colorful hand-made scarves and tweedy wool sport coats, clearly old friends, push two tables together, call the waitresses by name----Sandy or Mackenzie or Anna---and start drinking coffee. They speak softly, smile when a familiar face walks through the door, and set a tone of gentility that informs their side of the restaurant for the morning. Other regulars, Stretch, Helmut, and Gary, sit at the bar perched on padded stools, gossiping, reading the Oneonta Daily Star, or following the ball game scores on the screen off to their left. Newcomers, usually families in ball caps, find themselves seated at tables toward the back, next to the restrooms or cash register. If the regulars are lucky, the willowy red-haired Jeri, Jeri Dobler, commands from behind the bar on weekend mornings. There, Jeri becomes the face of Doubleday. It'sless that she knows everyone’s name, which she does, than she knows them, where they live, what they do, what’s happened to them lately, and when their birthdays are. Not as a gossip, but as a friend and neighbor. Jeri lives in a tiny lakeshore house about 6 miles north of town that sits right on the water. And it is there that she looks directly out over Otsego, into what they call Hyde Bay, and takes stunning photographs. A dozen of them grace Doubleday’s walls between the T-shirts and the flat screens. The actual owners of Doubleday, manager Barbara Boulanger (French pronunciation) and chef Tim Searles worked for the previous owners for almost two decades before buying it themselves. While they remain for the most part unseen, their presence insures that a visitor from 25 years ago will enjoy the same food, fresh and never frozen, that they remember so fondly. So, the French toast, omelets, great muffins grilled crispy with real butter, homefries and generous portions of bacon continue to make Doubleday the place on Main Street that it always was. Walk west on Main, past the parking lot that serves Doubleday Field, then peer nostalgically in through the card shop display windows that surround the lobby of the defunct Smalley’s Theatre. Keep on another two blocks---past the County Court House, Mohican Flowers, and the local lumberyard. Turn left on Railroad Avenue, so-called because it runs along the old Cooperstown and Susquehanna Valley Railway Station, and discover a tiny secret (except to locals who love it) called Spurbeck’s Grocery. In fact Spurbeck’s is just down the street from the yellow warehouse now transformed into the first home of the actual Cooperstown Distillery, where they make real “sippin’” whiskey (and other spirits) on the premises. A banner above Spurbeck’s tells us that the store has just celebrated its 75th birthday. It’s easy to imagine trains arriving across the street, barely fifty yards way, and passengers stopping in for last-minute provisions. It’s an old small town grocery store with shelves chockful of almost everything, cases of beer stacked high toward the rear and in the walk-in beer cooler, and a glass case that runs down the right side of the store. It’s a kind of deli counter and in fact it yields, not far from the beer, a sub shop where they make most anything that constitutes a sandwich. But what they are most famous for (in fact half the restaurants in town feature it on hamburgers and in salads and omelets) is Spurbeck’s cheddar. “We age it a full year,” says Dot, who, along with husband Roger, owns the grocery. And as she tells you about the magic of the aroma, she wraps a slab of pale yellow cheese in a sheet of real (genuine) wax paper and then deftly spins an old fashioned hank of butcher’s string around the whole package. It will make you think it’s 1949. Dot (“actually its Dorothy, but everyone calls me Dot”) and Roger somehow find a way to fit behind the small wood counter at the near end of the deli case and, like a long-married couple, which they are, they have choreographed their movements that allow them to pay bills from a tiny desk in the front window, ring up purchases from customers running in for this and that, and fish ingredients out from the glass case. They first met at Georgia Tech as students and came to Cooperstown where Roger’s family ran the grocery store by the railroad tracks. Roger served as the Cooperstown Postmaster and retired in 1991. Nine years later they took over the store. Like so many of Cooperstown’s shopkeepers, they came to town from elsewhere, or returned to town from somewhere else. To call them dour would be both an understatement and a serious error. They only look like they have materialized from the vapors of Grant Wood’s American Gothic. Engage them and find interesting, warm, open people who happen to run a small town grocery. And, like so many others in our Hidden Cooperstown discovery, Dot and Roger open up to the inquiry of strangers, of friends, and of customers. No buzz, no drama, no ‘tude. Today Cooperstown sports one supermarket chain store, Price Chopper (a Schenectady-based company), on Chestnut Street, the other major thoroughfare that bisects Cooperstown North and South. It’s a small supermarket, no more and sometimes a bit less. Parking is cramped, the aisles packed with liquids of all kinds, and the staff uncommonly welcoming. But, just down a street that parallels Chestnut, past the Taylor Oil Company and the high school, you can find an alternative -- Cooperstown Natural Foods. There is precious little parking, the aisles are crowded with nuts and 15 gluten free mixes, with a small alcove devoted to organic fruits and vegetables. The dairy case features yogurt that is as far from Dannon as Cooperstown is from Albany; the freezer shelves carry only free-range chicken and local beef and lamb. The owners, David and Ellen Poulette (yes, of French Canadian origins) are uncommonly friendly, knowledgeable, and devoted---to each other and to the foods they carry. “We wanted to sell only foods with no additives, organically grown, and pure,” David says, as he smiles approvingly into Ellen’s eyes. And she gleams back. Surely theirs is a labor of love. Like Spurbeck’s, this is a multi-generational, a family, business and it clearly rests on something other than the bottom line. Unlike Spurbeck’s, Cooperstown Natural Foods has been around for fewer than 15 years; but therein lies the tale. David and Ellen have lived in Cooperstown, raised their four children there, since the 1970s. 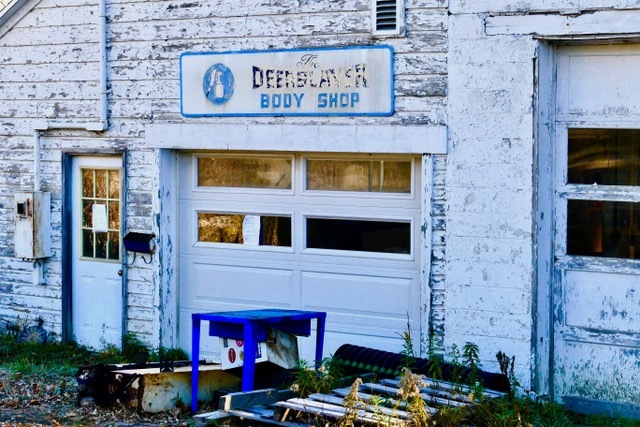 For the first thirty years, they supported themselves on David’s car shop, the Deerslayer Body Shop, whose vine-covered cinder block walls are just yards down the street from the Natural Food Store. In 2002, when they realized that it was almost impossible to purchase the kinds of clean, pure foods that they hoped to feed to their children, they built a small grocery on the adjacent property. Five years later, in 2007, they closed the body shop and devoted themselves full time to their new Natural Foods store. It is quite literally their baby, and they shower it with the love and attention of devoted parents. But, unlike some “health” food shops, they make absolutely no attempt to declare their moral superiority, to “sell” the virtues of their product and produce. Instead, like an intimate corner tavern or a neighborhood barber shop (now long gone from Cooperstown’s Main Street), David and Ellen love to schmooze, to talk to their patrons about almost anything, but especially in David’s case his unbridled devotion to the Buffalo Bills of, as they say, The National Football League. This in a town where baseball is king, where the souvenir shops only stock baseball cards, signed balls, baseball-themed clothing and all the paraphernalia in between. Visit the Cooperstown Natural Foods market and you will find only the purest of products and, if you are so inclined, a dandy lesson in the virtues of the Bills. It takes about five minutes to drive from Cooperstown Natural Foods to the Art Garage and then to Origins. Head back toward Price Chopper, turn right onto Walnut and then right onto Susquehanna Avenue. Past the magnificent Clark Sports Center the road becomes County Route 52, crosses Red Creek and winds into the former hamlet called Bowerstown by the locals. Just around the bend, turn onto the whimsically named Beaver Valley Road, which ribbons southward like the nearby and parallel Susquehanna River. This is a stretch of rolling hills, manicured and fenced Clark farmlands, and homes that sit on serious acreage. Just after turning onto Beaver Valley Road from Otsego County 52, on the right, hidden by a spray of untamed bushes, a small circular driveway reveals a small and picturesque white clapboard farmhouse supported by a sturdy, hand-hewed stone foundation. The grounds of the home are glorious, fall spectacular, with flowering vines and shrubs that give way to a hillside that seems to stretch its dewy green hands up into the sky. A few feet from the entry to the farmhouse sits a three-bay garage whose pedestrian form is betrayed by a dated telephone perched on a small shelf next to the first garage door. Press the button on the phone and within seconds the door of the house opens to reveal a slender and smiling woman followed by a miniature schnauzer sporting deep green toenails. Sydney Waller looks to be somewhere between 40 and whatever. She carries herself with zest and joy, eyes smiling and winking depending on the subject, and filled with youthful energy and wonder. She greets you in a way that makes you feel pleasure not just in her company, but in her passionate interest in art. She walks over to the garage, flips a switch, and the old wooden door raises itself directly up and away from the building. Inside is the main gallery of the Art Garage, probably a space 16 x 24, larger on the inside than seems possible from the outside. The other two bays reveal, first, a kind of storage workshop space and then a real garage in which sits a true MG classic (model B) small enough that a fleet of three could fit in this part of the garage and so small that one has to sit in the passenger seat by climbing over the door and lowering oneself into to the soft leather seat feet first, rear end last. The space of the Art Garage allows for many shows----miniature mobiles twisting in the breeze one month, wooden models of farm equipment another. Sydney’s artists are well-known, if not to the art public, then to her. They become her friends and she loves to introduce her friends in the gallery to her friends in town. Her aesthetic embraces a blend of fine and folk art, of finish and splash. A local retired farmer constructs elaborate bird houses that become bright pastel beasts in three dimensions. Sydney has placed a half dozen of them in the garden of Origins, the greenhouse café just a quarter of a mile down Beaver Valley Road. This Smith graduate, former local public school art teacher and Main Street gallery owner (priced out by the profusion of souvenir shops) begins and ends each of her shows with a reception. There, Cooperstown friends meet and talk with the artist as Sydney beams with grand satisfaction. Always on the first Friday of a new show. The local weekly paper will tell you when. No, it’s not Western Mass, but along Beaver Meadow Road, on the meadowed way down past the old farmsteads of Pangmans and Squires you will discover Cooperstown’s second organic food oasis, Origins Café at Carefree Gardens. And, no, it’s not simply a place of extraordinary beauty, but also offers a very welcome addition to the culture, food, and ambience of Otsego County. When you enter Origins, through the screen door of what looks to be a classic glass greenhouse, which is just what it is, you may or may not find anyone who resembles a staff person. The main dining room, chockful of plants and Indian tablecloths and of pottery and a half-dozen birdhouses, is airy and spacious. Nothing matches. No two tables, or four chairs or soda-bottle tumblers. It’s part of the charm that everything seems to be one of a kind. As you simultaneously take in the vision of the outdoors refracted through the greenhouse windows and the rich scent of spice that clings delicately over the room, several women emerge from behind a screen. They smile, privately at each other, warmly to visitors. Two of them are in fact, the closest thing to a match in the entire restaurant. And the third, older and hardy, but no less charming, is their mother. The Leonards, Kristen, Dana, and Mary operate Origins along with a less visible male partner -- Brent, husband and father, whose family has owned the farmstead for generations. The Leonards moved back to Cooperstown thirty years ago to open a greenhouse on the family property. As the two sisters, Kristen and Dana, grew into adulthood, they imagined opening a restaurant in the image of the farm-to-table culture they had grown to embrace during and after college--- armed with degrees in ecological management and studies from Duke and Skidmore. Not unlike the Marras, they each preside over their own domain---Dana as chef, Kristen as decorator and manager. And, Mary, proprietor of the thriving Carefree Gardens plant nursery and landscaping business, guides their work with a steady yet virtually invisible hand. The food and the atmosphere of Origins, like its owners, work together perfectly. The artisan quality of both, batik prints swaying gently in the breeze, and Spurbeck’s Panini---a silken blend of cheddar, apples, and wildflower honey (with each ingredient identified by local source) conjure up memories of a different time and even place. At Origins the soups are delicate, the hummus fresh as a spring day, and the ice cream filled with flavor, not just sugar. Served in the greenhouse café, with autumn light slanting in though the panes, a mid-day lunch is a picnic and a trip into the American past. Thanks to Dana and Kristen, who have embraced the 1960s spirit of sustainability, Origins Café participates in WWOOF---World Wide Opportunities on Organic Farms. And it was through WWOOF that Kristen and Dana brought the Origins concept to their family farm. In fact, the sisters, traveling in Peru under WWOOF sponsorship, first dreamed of opening an ecologically based restaurant. Now, as part of the WWOOF network, Origins Café accepts WWOOFers for days or weeks, who work in return for bed and breakfast, and learn firsthand the theory and practice of organic farming. As the name suggests, this is a community spread out over the globe with the goal of changing consciousness about ecological farming. While Origins feels local, in fact, it participates in an international organic food/farming network. This visit to the “other” Cooperstown would not be compete without mention of one more family and institution—the Blue Mingo Grill just north of town and its owners Cory and Michael Moffat. Neither the Blue Mingo nor the Moffats are a secret to Cooperstown or to its summer visitors. The food is simply excellent and the welcome without peer. But the owners are friends of this long-term visitor and he will sing their praises but softly. Professor Peter Rutkoff chairs the Department of American Studies at Kenyon College in Ohio. A member of the Glimmerglass Film Days Steering Committee, he is the author of recent non-fiction works that examine African-American art and culture, as well as two novels, most recently Irish Eyes. He is a regular summer visitor to Cooperstown, which is also the setting of his book of short stories, Cooperstown Chronicles. All photos in this article are ©Peter Rutkoff. Note: Come November, both Origins Cafe and the Blue Mingo are closed for the season.